BLOODSTONE is about to hit the shops. I am really pleased Athelstan is back, he has to investigate grisly gruesome murders against a vivid backdrop of London in the freezing winter of 1380. Athelstan was living in dangerous times; England was moving, not towards a clash between the great barons, but those who called themselves the Earthworms, the poor, the marginalised. A few months later, the entire southeast of England erupted into revolt. Athelstan will, one day, have to make choices about what side he is on. I’m currently finishing another in that series, THE STRAW MEN; this is mainly based in the Tower. I thoroughly enjoyed doing the research on this and came across a most interesting entry. Apparently, the Royal Menagerie was kept there; this included lions and leopards, gifts to the King from rulers in the Middle East. However, one gift must have surprised Londoners (as well as the elephant), a gift from the king of Norway, a huge polar bear which was allowed to swim in the moat! Naturally, the bear makes an appearance in THE STRAW MEN! The MIDNIGHT MAN (to be published early 2012) is another of my Canterbury tales, and it led me to investigate the seedy underbelly of medieval superstition; some very, very dark figures lurked there. I certainly wouldn’t like to have tea with them, or worse meet them in a cemetery at the dead of night, sinister souls with dark designs and even darker ambitions. I enjoyed writing it so much this led me onto other research. Soon I hope to return to one novel I’ve always wanted to have published about the last days of Henry VIII, in my view one of England’s greatest serial killers……. Was he murdered–-like Stalin by those around him? Was he thrown into his tomb at Windsor? Interestingly, when they brought Nelson’s corpse back from Trafalgar, they remembered a beautiful marble tomb lying empty at Windsor. It was first meant for Wolsey (but he fell from power) then Henry VIII (but they wanted him out of the way – fast!) Anyway – Nelson got it! Funny old life – isn’t it? November is the month of Remembrance; the season of mist and mellow fruitfulness is fast giving way to harsh winter. Four hundred and sixty-six years ago this November, Henry VIII was locked in intrigue, plot and counter-plot in his palace at Westminster. Henry knew he was about to die and the Wolves on his council could sense blood. For the next three months London, England and Europe watched the macabre masque unfold and the grisly dance swirl about. I merely mention this as I am about to submit my novel, “The Last of Days” to Headline. This is the Journal of Will Somers, Henry VIII’s jester, who describes the murky politics surrounding his dying king. I do hope readers will enjoy and be fascinated by his compelling story. 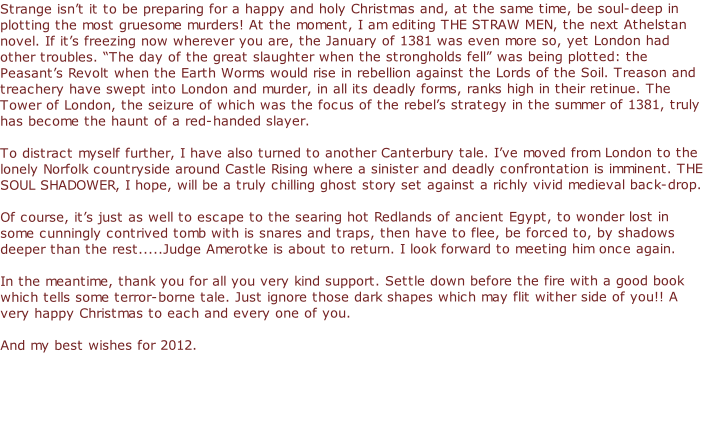 At the same time I have nearly finished ‘Roseblood’ which is set in London in 1455. The city is a bubbling pot of intrigue. Henry VI is losing his mind and the reins of Government are fast falling into the hands of his beautiful but ruthless young queen, Margaret of Anjou. Margaret depends heavily on the Beauforts. Indeed there are whispers that Lord Beaufort is Margaret’s secret lover and the true father of her son Edward. From the North Country, Richard Plantagenet, Duke of York, and other war lords watch the politics of London as a cat would a mouse hole. York argues that should the king’s wits fail, he, not Beaufort, should be Protector of the realm. Of course Richard dreams visions of an Empire where, perhaps York, not Lancaster, wears the crown. In London, the great families are divided.The gang leaders are preparing to whistle up their followers. It is the time of the dagger, the blood feud and, above all a unique opportunity for advancement, riches and power. Simon Roseblood, owner of the ‘Roseblood’ tavern in Queenhithe close to the river, realises war is coming. Simon’s allegiance and that of his family are to Lancaster and the Beauforts, who have set him a number of tasks, which draw him into a maze of murderous mayhem….. Simon not only has to counter the power of York, the intrigues of the city and the sinister presence of Amadeus Sevigne. Ghosts from the past also gather close; harbingers of fury from Simon’s blood-soaked days as a soldier in France. I am enjoying writing ‘Roseblood’ immensely. I am also very pleased to see so many of my tales coming out as e-books. I do hope all is well with all my readers. I thank you for reading this. The aggressive Italian families of New York in the mid-twentieth century seem to have a great deal in common with the warring factions of fifteenth century England. During both eras, gangs fought to control power. Two important consequences followed from this. First, you had to make sure you were with a member of one of the gangs. Secondly you never betrayed your family or your gang. York, Lancaster, Beaufort, the Howards and the Tudors in my eyes were essentially hoodlums. They could anoint themselves, found Oxford colleges, portray themselves as devoted sons and daughters of Holy Mother Church but, in truth, they were Mafioso fighting a protracted gangland war and, unfortunately for some, the Tudors won! One of the most striking similarities between the gangs of medieval England and those of the mafia is the concept of the blood feud. The Wars of the Roses often came down to one family trying to exterminate another. Once a member of a family had been killed no compromise was shown. Edward IV lost his father and brother at the violent battle of Wakefield; their severed heads, lampooned and crowned with paper hats, decorated Mickelgate Bar in York. Over ten years later, Edward and his brothers shattered the Lancastrians at Tewksbury, even following them into the abbey, hacking and cutting; the effects of such violence can still be seen today. A blood feud was á l’outrance – to the death! For example, the Yorkists always feared John DeVere, the Earl of Oxford. He was a good soldier and a very astute general. Edward IV tried to bribe him with all sorts of inducements. Oxford’s response was very stark: “You killed my father so I will kill you.” At Bosworth in 1485 Oxford was given his opportunity when he led the Tudor/Lancastrian faction to total victory against Edward’s brother, Richard III. Like the warring mafia families, the lords of the fifteenth century struck at each other. At the violent battle of Townton, Edward of York instructed his soldiers “Kill the leaders, spare the commoners.” In the blood-lust which followed the Lancastrian defeat, little mercy was shown to anyone. At the battle of St Albans (1455), the climax of my novel, I argue that the Yorkists hired master bowmen to take out the Lancastrian high command and these proved to be very effective. However, my novel is not seen through the eyes of the great lords but through the eyes of a London family who will support one faction through thick and thin. The Krays may have dominated post war London but, believe me, such a gang has a rich and ancient lineage! I would like to wish all my readers a very happy and peaceful Christmas and a prosperous New Year. For my part, I promise I shall do my level best to create worlds of murderous, mysterious, mediaeval mayhem and so draw you in! ‘The Last of Days’ has just come back from the publishers for comment. I am certainly looking forward to the publication of this novel later in the year. The story is the journal of Will Somers, a real life character who also happened to be Henry VIII’s jester, though in those mysterious and murderous last days of this despotic king, there was very little to laugh about. In researching this novel I came across two sources of tradition. The first is how Henry VIII died in the early hours of Friday morning, 28th January 1547. According to the Protestant tradition, Henry died peacefully in his sleep pressing the hand of his confessor and the Archbishop of Canterbury, Thomas Cranmer. However, a contemporary Catholic source has Henry screaming at the ghosts gathering around his bed, slurping white wine and moaning that all was lost. Henry’s death was certainly mysterious and I discovered one gem, a very interesting nugget of information. 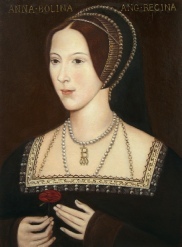 According to the Franciscan, Cardinal Peto, Henry VIII on his death bed, expressed deep regret over the death of Anne Boleyn. Now I find this very strange because the name Boleyn was virtually forbidden in Henry’s court, and Henry’s daughter, Princess Elizabeth, was rarely seen or heard. Of course, Cardinal Peto could be a biased source. In a recent lecture on Anne Boleyn, I pointed out how Cardinal Peto, when he was a Franciscan at Greenwich, publicly warned Henry that because of his marriage to Anne Boleyn, he would suffer the same fate as King Ahab in the Old Testament, that dogs would come and lick his blood! As you may already know, Henry was buried in St George’s Chapel Windsor, in February 1547. A funeral cortege bearing his massive body slowly wended its way from London to Windsor. One night the cortege stopped at the Bridgettine Convent of Syon on Thames, where, according to some reports, Henry’s bloated corpse exploded. The putrid mess leaked through both the lead casket and the outer elmwood coffin. More gruesome still, some wandering dogs entered the church and began to lick what had seeped from the royal coffin. Certainly a macabre story and there is some archaeological evidence that it happened, yet it is Anne Boleyn who fascinates me. She always maintained that she had neither been unfaithful nor committed treason, yet there is considerable evidence that something untoward did happen. I hope to resolve this in my next blog! In the meantime, I am pleased to announce that I have a short story available in e-book format, “The Knight’s Confession.” I hope to publish more in the very near future. To conclude, many thanks for your support and I hope you continue to enjoy my work. I wish you all the best for 2013. Finally, if you wake early in the hours of 28th January 2013, then, of your mercy, remember the ghost and soul of Henry VIII who died 466 years ago. If his death was due to natural causes or Henry was helped to join the choir invisible, that is another matter which will also have to wait for the next blog!